As part of this year’s World War I events, Kate Pullinger and Neil Bartlett invite you to write a letter to an unknown solider. In an effort to engage as many people as possible, this thought-provoking and moving venture encourages you to dig deep and think about what you would say to the people who lost their lives fighting to defend us in the years 1914-1918, as well as every war since. The letters submitted will be gathered to form, as the tagline states, ‘a new kind of war memorial made by thousands of people’. And you can be part of it. 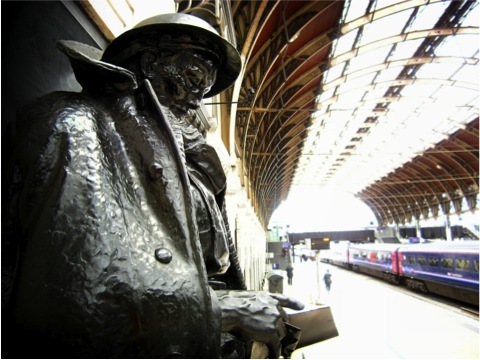 The idea was prompted by the statue on Platform One of London’s Paddington Station, which shows an unknown soldier reading a letter. Use this as your writing prompt this week, and write a letter of hope, of gratitude, of understanding, or whatever else you would like to share in memory of the sacrifice of countless thousands of people. The deadline for submissions is 4th August 2014. And if you need a nudge to get started, got to the 1418now website and read the letters already submitted, written by everyone from Stephen Fry and Andrew Motion to ex-soldiers and school children. It’s powerful stuff.